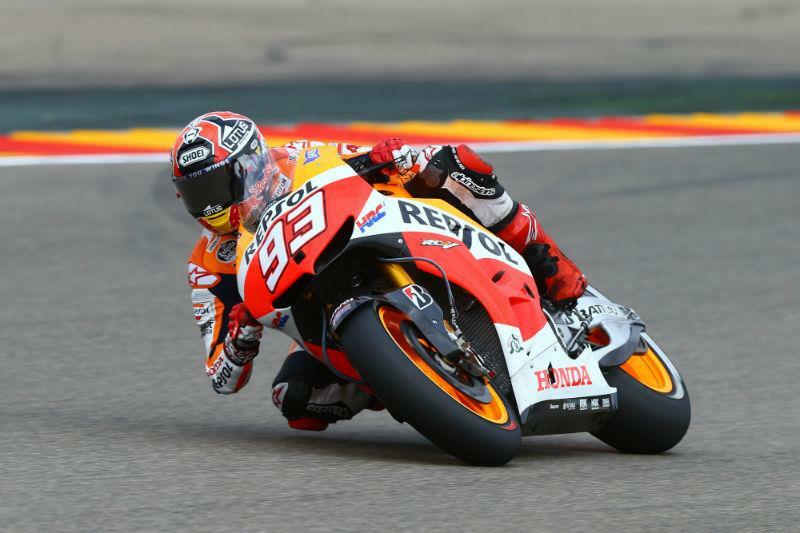 Repsol Honda rookie Marc Marquez has extended his championship lead to 39 points with victory in Aragon ahead of Jorge Lorenzo. Lorenzo got the jump and tried to stretch out a lead, but was unable to break the following pack. Marquez took to the lead with 10 laps to go and from there eased away from the reigning champion. It could have been a ompletely different podium had Dani Pedrosa not crashed out with 17 laps to go. Marquez ran right up to the rear of Pedrosa, who was in second at that point, and may have touched his team-mate. Marquez ran off the track and just a split second later Pedrosa high-sided out of the race. Pedrosa was taken to the medical centre and has a suspected knee injury. With Pedrosa out of the race the fight was on for the final podium spot between Valentino Rossi, Alvaro Bautista, Stefan Bradl and Cal Crutchlow. Rossi came out on top, but not without a fight from Bautista, who finished fourth after a brilliant last lap battle with Bradl which saw the pair swap positions several times in just a handful of corners. Crutchlow finished sixth, 14 seconds back of Marquez.